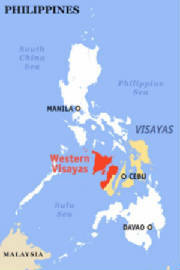 Western Visayas, one of the regions of the Philippines, is designated as Region VI. It consists of seven provinces, namely, Aklan, Antique, Negros Occidental, Capiz, Guimaras, Iloilo and Palawan and 17 cities making it the region with the most number of cities. Iloilo City is the regional center of the region.